Liz Longley: Five CDs and still in her 20s. I’d circled Nov. 29 on my calendar several weeks ago, waiting patiently for the return of singer-songwriter Liz Longley to perform live in Portland. Liz is most likely under the radar for most people. But no matter. I think she’s equally talented as a lyricist and a performer, toggling back and forth between acoustic guitar and piano and singing with delicacy or verve, depending on the song. My longtime friend, Mike Granberry, is the one who first told me about Liz. He’s a music critic for The Dallas Morning News and sees plenty of acts come through that city. I checked her out at a May 2015 show at Mississippi Studios and was suitably impressed. She was touring then in support of her self-titled CD, her first since relocating from Philadelphia to Nashville. Last night Liz played several songs from her newest album, “Weightless” and made sure to perform a few older favorites, including “Camaro” and “Bad Habit” — both songs about ex-boyfriends — and “Unraveling,” a ballad about her grandmother’s battle with dementia. She was joined on stage by Brian Dunne, a classmate from the renowned Berklee College of Music in Boston, who performed a solo set and then came back for a few songs with Liz. Tuesday was my first time at the Alberta Rose Theater, a renovated movie theater in Northeast Portland known for presenting live music, comedy and vaudeville. It’s an intimate space with general admission seating and a bar serving beer, wine and snacks. I was four rows from the stage, maybe 30 to 40 feet away, so I had a great view. After the hour-long concert, Liz came out to the foyer to meet with fans, pose for photos, and sell her merchandise. She’s released five CDs and she’s still in her 20s. A selfie after the show with Liz. Liz performed in Dallas in October and, according to my friend Mike, put on a great show. You can read his review right here. Tuesday night was the first date on Liz’s West Coast leg of her national “Weightless” tour, which began in mid-September. She performs tonight in Seattle and finishes up in southern California on Dec. 10. I’ll be keeping an eye out for her next visit to Portland.With any luck, it’ll be a weekend show and Lori can join me. And maybe by then, Liz Longley will be a better known name. Proud parents Jamie and Jordan with their animated daughter Emalyn. Technically, it was just a four-day break from Thanksgiving through the weekend. But it felt longer — and for good reason. We had not one but two visits during the break from youngest son Jordan, daughter-in-law Jamie and granddaughter Emalyn. The trio arrived Tuesday night, marking the first leg of their roughly 400-mile road trip to see Jamie’s family in southern Oregon. They hit the road early the next morning but on their return home, they stopped in again Saturday to spend the night. Emalyn May Rede: Is there a happier, more content baby anywhere? In between, there were movies and a board game, trips to the doctor and a veterinarian, a fabulous holiday meal for two, a visit from other family members, and lots of “homework” for yours truly tied to the near end of my first term teaching a full-time class at Portland State University. All of this activity made for a stretch of days marked by relaxation and good eating, medical peace of mind, and a last burst of effort needed to prepare for my last two classes and final exam in Media Ethics. Where to begin? I suppose a chronological approach will do just fine. And if this is TMI, my apologies. Thanksgiving is my favorite holiday and being around people I love is the reason why. Jordan and Jamie were married Nov. 22, 2009, on a brisk autumn day. Wednesday: Lori and I both worked, but treated ourselves to a first-run movie at the Hollywood Theater. “Moonlight” has been getting rave reviews for its portrayal of the humanity not often seen in films about African Americans. I can see why. The director, writers and cast are all black, and the film crackles with emotional authenticity. It’s a serious movie about bullying and survival, relationships and resiliency, and the yearning to be seen and loved for whom one is. I liked it a lot. Thursday: Lori worked her magic in the kitchen, roasting a turkey and preparing delicious side dishes that provided meals for the next few days. I helped, but all credit goes to Lori, who is a wonderful cook, just like her late mother. We hauled out Blokus, a board game we hadn’t played in a long time, to help pass the time on a rain-soaked afternoon. After dinner, we watched a movie in the comfort of our home — “Jobs,” the biopic of Steve Jobs’ rise from college dropout to business/technology genius as the head of Apple. Rum-infused egg nog always helps when you’re playing a game of strategy. Ashton Kutcher was surprisingly good in the lead role, capturing Jobs’ brilliance as well as his unlikable, uncompromising personality. This movie was the 2013 version. Not sure I’m all that interested in the 2015 version, but who knows? Friday: I went to the doctor to see about these dog bites I incurred three days earlier. The cuts on my right arm and left hand seemed to be healing just fine on their own, the nurse practitioner said. She filed a report with the county animal control office about the bites, but since we have no idea who the owner is, there’s no one to hold accountable. I dove into two stacks of papers written by my students. One, a mandatory assignment; the other, an extra credit option. Both kept me busy through the day and into Saturday. Saturday: We took Charlotte to the veterinarian’s office to get her checked out, too, a day after Lori discovered what I had missed. Turns out Charlotte sustained a bite just an inch away from her tail. We hadn’t seen it because of her black fur and because it had begun to scab over so quickly. The vet prescribed some antibiotics and another medication to help the wound heal, and called our little dog both healthy and lucky to be alive. As you can imagine, Charlotte got some extra love these past days, along with more than a few morsels of turkey. Sunday: After a nice breakfast with Jamie and Jordan, we had Lori’s brother, Jim, and our sister-in-law, Judi, come over to see the kids and meet Emalyn. It’s hard to imagine a baby that’s happier and easier to care for than Em. She smiles all the time, sleeps soundly and regularly, and travels well, her parents say. Nonni Lori holds her stylishly dressed granddaughter. Tummy time provides a great vantage point for a close-up. Judi and Jamie are mesmerized. Emalyn clearly is not. I spent the afternoon tackling my next assignment — preparing the final exam for my 35 students. The two-hour final is scheduled for next Tuesday, December 6. Once the tests are scored and the grades are officially submitted to the university, I can look forward to a break before diving in again with a new class on Media Literacy in January at PSU and two more communications classes at Washington State University in Vancouver. I will be a busy man. Charlotte romping on the grounds of the former Washington High School. Thirty seconds is all it took. I arrived a little after 2 pm Tuesday at the Southeast Portland dog park where Charlotte and I have become regular visitors. The skies were overcast and the grassy field next to a former high school appeared to be ours alone. As we drew closer, we could see two large dogs probably 50 to 60 yards away, chasing a ball and each other while a woman, their presumed owner, stood nearby. I let Charlotte off her leash and she began trotting towards the pair. The dogs looked up and Charlotte sensed something wasn’t right. She did a quick 180 and began sprinting back toward me. I scooped her up and she let out a yelp just as the two dogs arrived simultaneously. Just that quick, things turned ugly. The dogs leaped at Charlotte but got me instead. I yelled. I turned in circles, facing one then the other. I felt a tug on the sleeve of my windbreaker. And another tug. And another one. I kicked at one dog and got it in the head. . I yelled at the woman to get her dogs away. I kept turning, shielding my little terrier from this sudden attack. Eventually, they stopped. I felt something warm and wet near my mouth. I put my fingers to my lip and bright red blood appeared. I realized it was me — not Charlotte — who was bleeding. All I could figure was that in clutching her tight to my chest, her teeth had pierced my lip. The dogs were gone. A woman who saw the ruckus asked if I was OK. I said I was and headed into the former high school building to find a washroom. When I looked in the mirror, I saw the dogs had ripped open tears in both jacket sleeves. When I got home and peeled off my shirt, I discovered a gash above my right elbow and puncture wounds nearby. I also had small cuts to two fingers on my left hand. Souvenirs from an encounter with two aggressive dogs. Minor cuts on two fingers. Could have been worse. Fabric on both sleeves was torn away during the attack. In that half minute of hell, I realized just how easily a dog can flip the switch from playful to aggressive. I have no doubt those two — pit bull mixes, I’m sad to say — would have hurt Charlotte badly if they’d gotten to her. In the moment, I feared they wouldn’t stop and would latch their powerful jaws onto me. During those 30 seconds, I heard the woman yelling at the dogs and saying something about one of them belonging to her sister. Whatever. All I know is they were completely out of her control. I couldn’t identify her if she were sitting next to me. All I know is she was white and maybe in her 40s or possibly her 50s. I drove Charlotte to another part of town where they have three separate fenced-off areas for large, medium and small dogs. Charlotte was the only bantamweight, so she and I had alone time in the play area at Normandale Park. It was raining lightly but the thick tree cover kept us mostly dry as we walked among the leaves, twigs and bark. All alone in the small-dog area at Normandale Park. Charlotte waits in vain for someone her size. I felt badly for Charlotte, but thankful that she wasn’t traumatized. 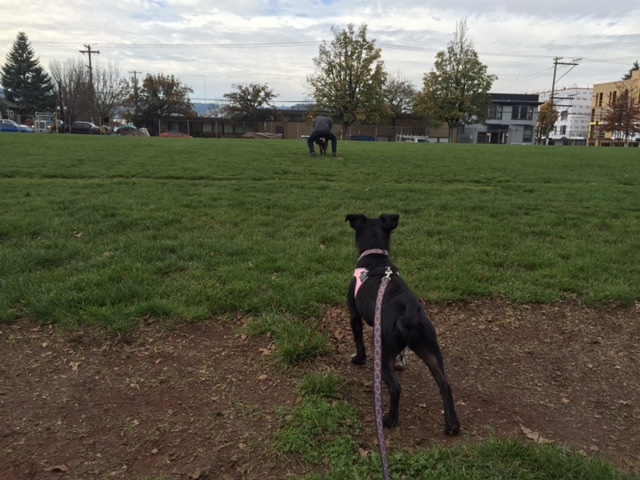 Every other visit to the Washington High School dog park had been safe and fun. Not a single dog had been remotely aggressive toward her. We had come to view the open field as our own little refuge in the city. I won’t stop taking her there because of the attack, but I will be much more cognizant of big or potentially aggressive dogs. And I hope that woman has the sense to keep her beasts away from public places. It wasn’t hard to imagine the damage they could inflict on a child or even an adult, let alone a small animal. Charlotte looks longingly at the grassy field where she’s become a regular visitor. Like everyone else in my blue circle of friends, I was devastated on Election Night. Until now, I’ve not written a thing about my take on our new president-elect and the ugliness unleashed by his campaign, now amplified by his victory. Suffice to say that as a lifelong civil libertarian, a person of color, the father of a gay daughter, and a progressive who expected our first female president would build on the policies of our first African American president, I was aghast that America instead chose an aging reality TV star to lead our nation. The thought of this pretentious gasbag occupying the most powerful office on the planet for the next four years was appalling enough. But when I heard the names of Giuliani and Gingrich, and of Christie, Palin and Bannon being floated as Trump appointees, I got downright depressed, even fearful at the thought of what damage these hacks could do to our country. And so it was that I found release in the most unlikely of places: a dog park. Since Friday, I’ve visited the grounds of the former Washington High School four times with our little dog, Charlotte. It’s in Southeast Portland, about two to three miles from our home, but it’s become something of a refuge for us. The big grassy lawn is bordered on three sides by a cyclone fence. There’s no play equipment, no ball fields. Just a big open area for canines and their humans to mingle in small groups or spread out for a game of fetch. 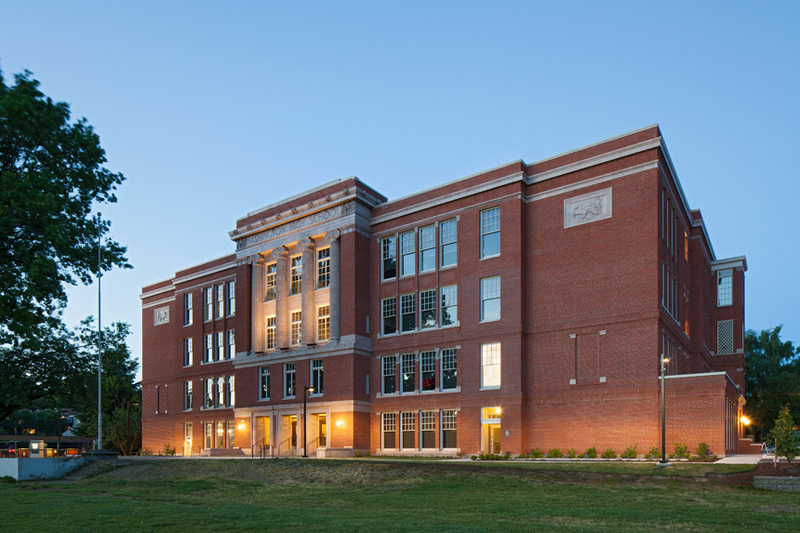 Closed in 1981, Washington High School in SE Portland has been redeveloped into commercial office and event space. The high school closed in 1981 because of falling enrollment. It sat there for years, vacant and neglected, until three years ago, when the school district sold the building to a private developer with a vision for transforming it into a mix of commercial office and event space. These days, a local grocery store chain is the anchor tenant, with administrative offices and community meeting rooms in the remodeled classrooms. The auditorium has become a concert venue — the much-acclaimed Revolution Hall — and creative agencies have moved in as well. There’s also a restaurant on the ground floor, aptly named Martha’s Cafe, with a few outdoor tables on a patio facing the dog park. The first time we came, Charlotte found a fellow terrier named Sybil to run and play with. Sybil, a Humane Society adoptee, shagged the ball while Charlotte, a rescue dog herself, ran alongside, the two of them racing as if they were greyhounds. The second time we visited, Charlotte made friends with Moose, a four-month-old pit bull with a wrinkled face and a clumsy puppy gait. Moose was no match for our Terrier-Chihuahua-Pug mix as Charlotte literally ran circles around him, occasionally darting between my legs as I stood chatting with Moose’s owner. The third time, on Sunday, is when I realized this ordinary park had become a restorative place. There were no dogs around, just Charlotte and me. I unhooked her leash and we walked along the perimeter of the fence abutting Southeast 12th Avenue. 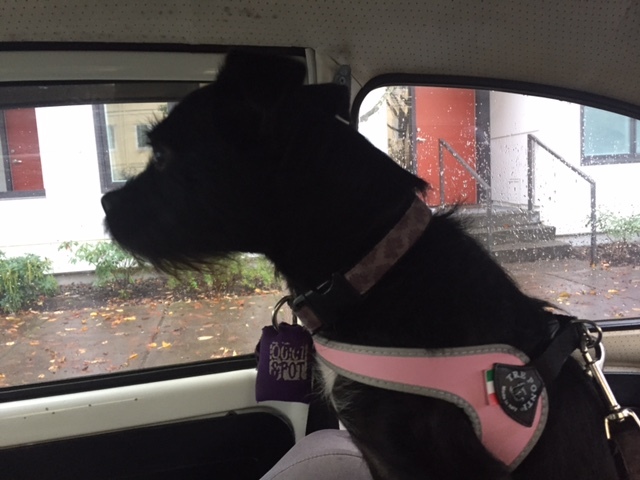 Charlotte, in her spiffy new harness, gets ready for the ride. Like so many other places in Portland, there are homeless people camped out here on the sidewalks adjacent to the old school. It occurred to me that with all the bombastic talk of eliminating ISIS, dismantling Obamacare and building a wall, Washington, D.C., is the last place we can turn to for help dealing with our shortage of affordable housing, rising rents and increasing homelessness. Our walk turned into a side-by-side trot, and then we moved to the middle of the field, with Charlotte zigging and zagging and romping with me as if I were a four-legged playmate. That’s when it dawned on me that she’d lifted my spirits and gotten my mind off the election. The thought that this scruffy little creature, who was picked up on the streets two years ago, is now so happy herself and such a part of our lives made me appreciate the moment. Whatever darkness I was feeling about our nation’s drift to the right dissipated that afternoon. It may not have been church, but I left the grassy dog park that day feeling as though things will be OK. Who knows if our president-elect will be a disaster or a stunning success? Either way, I know life goes on…and there’s nothing wrong with a small pleasure like running with your mutt, free of tension and focused on the moment. I made time again this morning to take Charlotte to the park. There we ran into Diesel, a brindle boxer with a gray muzzle and a playful nature. I smiled again watching our little girl having a blast running with a dog four times her size. Editor’s note: After the inevitable became the inconceivable and the nation awoke to the reality of a ludicrously unqualified president-elect, social media was flooded with howls of anguish from progressive people all over the country. Few were as eloquent as Sharon Tjaden-Glass, a writer and educator pregnant with her second child in the swing state of Ohio. I’m pleased to give Sharon’s splendid post, originally published on her own blog, a second home here on Rough and Rede II. Old Glory, listless on a Dayton street. Sharon Tjaden-Glass, one fierce mama. In 20 years, when the Baby Boomers have lost their political power and the Millennials shift the political landscape, let’s make certain that our children will not have to face an election like this ever again. Sharon Tjaden-Glass is the author of “Becoming Mother: A Journey of Identity” available in print and Kindle editions on Amazon. She is also teaches English as a Second Language in the Intensive English Program at the University of Dayton. You can read more of her writing at http://becomingmotherblog.com. Editor’s note: Unless I’m overlooking someone, I know all of five people who live in Ohio. Recently, I became acquainted with a sixth: a talented writer who came to my attention when I bought her book (“Becoming Mother”) as a gift for a daughter-in-law. I complimented her writing and soon enough Sharon Tjaden-Glass and I became friends on Facebook. I thought of Sharon when I read a terrific piece in The New York Times that pointed to Dayton, Ohio — where she lives — as a place that typifies the trend of college-educated millennials moving away from red states to blue ones, leaving less educated, less mobile residents with diminished employment prospects and few cultural offerings. Would she consider writing a guest blog from the perspective of a Dayton resident in her 30s? To my delight, she said yes. I don’t live in a glamorous city. The only time you’ll see tourists around here is during the annual Dayton Air Show or some anniversary related to the Wright Brothers. We are very proud of the fact that Orville and Wilbur lived and worked here in Dayton, Ohio. And we loathe that North Carolina proclaims that they are “First in Flight” on their license plates. Dayton, Ohio isn’t a city where people try to live. We were born here or we end up here through circumstance. My husband was born here. He is a third-generation Polish boy, on both sides. His grandparents settled in the Dayton area in the early 1900s. I ended up here through circumstance. My Minnesotan parents moved here because my father got a job as a bakery supervisor with a chain of grocery stores called Supervalu. This isn’t to say that Dayton is a bad place to live. House prices are very reasonable. Our $200,000 four-bedroom house would go for $1 million in the posh suburbs of Washington, D.C. If you work and live in Dayton, the commute is pretty much always twenty to thirty minutes. We have plenty of places to shop and dine. Plenty of movie theaters and a few performing arts centers. If you want a good public education, I could recommend at least five different school districts. We have at least six institutions of higher learning, including private and public four-year colleges and two-year community colleges. I get why people move away, though. The largest employers in this area are Wright-Patterson Air Force Base, Reynolds & Reynolds, Lexis Nexis, two local hospitals, our public school systems, and a few universities. Read: jobs for engineers, business, health care, and education. Certainly, those are robust fields. But there’s not much diversity of jobs. And here’s where we struggle. American millennials—especially college-educated ones—are looking for more out of their jobs than just a steady paycheck. Maybe it’s because we know that the likelihood that we’ll be able to stay in a job for longer than ten years is pretty slim. We know that we need to be thinking about the next job as soon as we take the one in front of us. And no, it’s not because we have trouble with loyalty. It’s because we’re generally distrustful of corporations. (We know that they too often undercut their own employees in order to post profits for their investors.) So we’re looking for places to live where we can imagine Plan B, Plan C, and Plan D.
Having only a Plan A can be a bit risky. When it comes to providing opportunities where people in their 20s and 30s can imagine mapping out some kind of career, however meandering it might be, it’s hard for cities like Dayton to compete with larger metropolitan areas. In his recent opinion piece for the New York Times (“Go Midwest, Young Hipster,”), Alex MacGillis reflects on how this phenomenon of millennials clustering in larger cities is affecting our political landscape. When all the college-educated voters, many of whom are Democrats, move to a blue state like New York or California, the power of their votes takes a dive. MacGillis points out that their votes would be more powerful if they stayed in their home state. He even goes so far as to name some of these millennial voters and their circumstances around moving away. Several of them were from—where else?—Dayton, Ohio. Okay, I admit. That makes me feel good about staying in Ohio. Every time an election comes around, I know that it matters that I show up to vote. Looking around my neighborhood provides all the evidence that I need. On the street next to ours, one house sports a Clinton-Kaine sign. The next one advertises Gary Johnson. And then comes the Trumped Up house. I kid you not, two ladies, one in her 60s and one in her 80s, have set up shop in their driveway. Selling Trump-Pence merchandise. Nearly every day. Their lawn screams Lock Her Up! and Make America Great Again with no fewer than seven signs. Political lawn signs sprout from the “Trumped Up” house in the author’s neighborhood. Dayton, Ohio, has an interesting mix. Former blue-collar workers who long for manufacturing jobs to return. The good ol’ days. Highly paid white-collar government employees who insist that they are self-made champions of their own universes. Did this all myself! Why should anyone else have more help? Military personnel who wonder if most Americans have even the faintest idea of what it means to serve their country. College students who are working part-time jobs to defray some of the costs. Public school teachers who wonder if they can survive another year of state-mandated testing while fighting to convince their local communities to pass school levies just so they can do their jobs. That’s life in a swing state. But sometimes I wonder, how much longer will Ohio be a swing state? What will happen when millennials turn 50 and the baby boomers are nearly gone? Are we looking ahead to a country where white Christians are no longer a majority demographic in this country? Or perhaps that is the exact scenario that strikes fear into the hearts of those who want to Make America Great Again. Because, as a millennial, I look forward to a more diverse America. I’m okay if Christianity doesn’t stay the most followed religion in this country. (And I am Christian). I like the idea of my daughter being a part of a classroom where more than just one or two kids are not white. I hope that she speaks out against bullies who insist that someone isn’t worthy of respect because of who they are. I’m okay with white Christian Americans becoming a minority in this country—because that demographic doesn’t define what America is. Thank God, America is much bigger than White, Christian, English-speaking, Straight. America is a set of values. America is Equality. Hard work. Innovation. Honesty. Freedom. Respect. Self-reliance. But America is also Empathy and Compassion. Values don’t have a face. But they have a heart. And from the bottom of mine, I welcome a United States where we see diversity as an asset rather than a liability. So to all those Midwestern millennials who have moved to Chicago and New York and Miami and San Francisco: When you’re ready, you’re welcome to come home. We need your vote. We need your voice. It might not happen this year. But when you get tired of the high rent, the long commutes, the small spaces, and the razor-thin margins of disposable income, we’ll be here waiting. Gordon Hirabayashi was a student at the University of Washington in Seattle when the bombing of Pearl Harbor on December 7, 1941, plunged the United States into World War II. Barely two months later, President Franklin D. Roosevelt signed Executive Order 9066 authorizing the imprisonment of thousands of Americans of Japanese ancestry. FDR’s order, signed February 19, 1942, sanctioned the rounding up of thousands of families up and down the West Coast who were sent to camps in ten states and held until after the war’s end. Hirabayashi, born and raised on American soil, refused to go, believing he and his family posed no threat to the U.S. government. Two others, Minori Yasui of Hood River, Oregon, and Fred Korematsu of Oakland, California, also resisted the curfew order All three men took their battle to the U.S. Supreme Court and all three lost. President Gerald R. Ford issued an official apology for Executive Order 9066 in 1976, but it wasn’t until the 1980s that the trio of dissenters received justice in the form of overturned or vacated convictions. On a recent Sunday afternoon, Hirabayashi’s story came to life. Lori and I and four friends saw the play “Hold These Truths,” produced by Portland Center Stage at The Armory in Northwest Portland. It was a one-man play, a 90-minute performance with no intermission, and it was splendid. Ryun Yu was marvelous as Gordon Hirabayashi. From the opening scene to the last, Yu channeled the intelligence, humor, wisdom and fortitude that characterized the young man who stood by his principles in the face of racial animosity. After the war, Gordon Hirabayashi continued his education at the University of Washington, earning his B.A., M.A. and Ph.D degrees in sociology . Simply by donning one pair of eyeglasses versus another, and by wearing a sport coat or a cardigan sweater, a bow tie or a necktie, Yu seamlessly moved in and out of time, with only two wooden chairs as props. He drew us into his character and into his lonely fight against an executive order that led to the forced removal of nearly 120,000 people from their homes. An estimated two-thirds of those who were rounded up were U.S. citizens, including our friend Nancy, whose family was among the 9,000 people sent to live behind barbed wire at the Minidoka internment camp in south central Idaho. She and her husband attended the play with us. I can only admire the sense of right and wrong that compelled a young man, then 25, to defy a wartime order that sent people to camps in 10 states across the country. Decades later, hindsight allows us to condemn the camps as a horrible civil rights violation. Gordon Hirabayashi taught at the American University in Beirut, the American University in Cairo and in Canada at the University of Edmonton, where he lived. The U.S. government eventually paid reparations to those who were imprisoned. And all three of the wartime resisters received the Presidential Medal of Freedom, the highest civilian honor in the United States — Korematsu in 1998, and the other two posthumously in 2012 and 2013. It was somehow fitting that Lori and I would see this play one day after we had participated in a Saturday night discussion of what the American Dream means to us. With the presidential election now only a week away, the timing also could not have been better as a reminder of what harm can come from demonizing an entire class of people based on their race, religion or national origin. We all know which one of the candidates has singled out Muslims, Syrian refugees and Mexican immigrants as threats to the U.S. The play continues through November 13. If you live in the Portland area, I urge you to go see it. Ticket information is here. Related reading from Voices of August: American internment in the shadows of Yellowstone by Aki Mori; My visit to Heart Mountain by Midori Mori.